The controversy surrounding Huckleberry Finn got some interesting air time on 60 Minutes last Sunday. The segment featured an interview with Randall Williams of New South Books, a small press in Montgomery Alabama. As you know, in January, the publisher announced the release of a new edition of Mark Twain's classic, replacing the N-word -- which crops up 219 times in the original -- with the more innocuous,"slave." Williams pointed out the book has been banned by many school districts. He said the new expurgated version can go back in the classroom. But David Bradley, a black creative writing professor from the University of Oregon, also interviewed on the program, said the original, N-word included, presents an opportunity for a "teachable moment." "It's a great book," said Bradley. "It's one of the greatest books in American literature." As for the N-word. "Get over it," he said. Of course, the idea of revising Twain smacks of censorship. Never a good thing from my point of view. 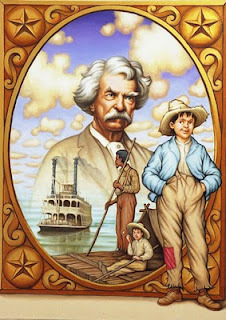 I read The Adventures of Huckleberry Finn as a kid, fully understanding the historical significance of the term from a modern day perspective. It conveyed to me then, as it does to readers still, a sense of the setting. I re-read it a couple of years ago for a book group, and felt uncomfortable again, particularly when specific passages were read out loud by one of the white women in the group. But shouldn't feeling uncomfortable -- frightened, disturbed, amused or any emotional reaction -- be part of the experience of reading? What do you think about the Huck Finn controversy? Expurgated books? Enforced political correctness in literature? To read a transcript of the 60 Minutes segment, or view it, click the link. Next week -- the blog tour for Quacky Baseball starts right here. Please check back for a great interview with Kristin Daly Rens, senior editor, Balzer + Bray (Harper Collins) -- and more on the tour. 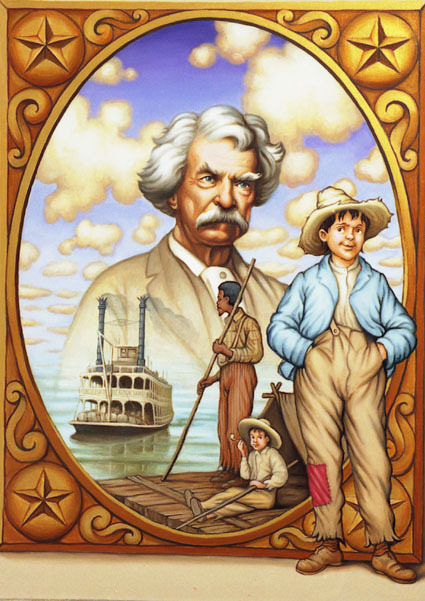 I think that censoring Mark Twain is wrong and people need to toughen up and stop wanting to coddle children. The world is an ugly place and kids need to be confronted with certain issues in order to be prepared to deal with our society. I don't think the book should be changed, because that's the way it was written. However, I wouldn't feel comfortable reading it aloud, and I would't want my boys to read the word out loud either. Maybe that's weird of me??? I agree with both of you, Michael and Julie. I don't want to read it aloud and I don't want my son to either. But I wouldn't want it to be changed. The beauty and power of the book is in the friendship between Jim and Huck -- a friendship that transcends that hurtful loaded word.